This clear glass gold rimmed edge decorative charger plate is 13″ in diameter. 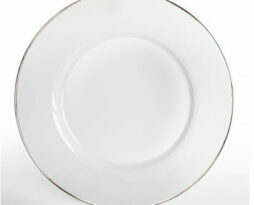 This charger plate is a simple touch added to your table setting. 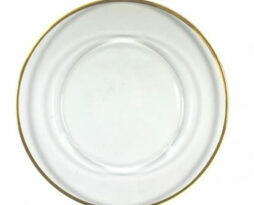 This service plate accepts a 6″ – 12″ round ceramic dinner plate. Rent this item to add style onto your Chicago special event table rental tablescape. This clear glass gold rimmed edge charger plate (service plate) is very common for use in wedding receptions, corporate functions, fund raisers, benefits, galas, product introductions, and for any event where making a very elegant and stylish impact is the intended result.